The EXCLUSIVE OPTION Houndstooth Pepita Style LWB (Light Weight Bucket) Seat Inserts. Our standard of craftsmanship has been described as OEM-Like, and this philosophy has been applied to this product, which seamlessly installs into your LWB equipped Porsche to uniquely enhance the interior in the spirit of the raw 911R, elegant 50th Edition, and iconic millionth 911. Our LWB Seat Inserts fit perfectly just as the the original Alcantara LWB seat inserts, and installs in minutes with a series of factory style velcro attachments. When installed many will not be able to identify our product as anything but factory installed. We utilize the original foam core and provide easy to slip-on covers; they are installed in the same exact manner that the OEM Alcantara covers were. We have taken steps in developing these bespoke seat insert covers to match the original specifications for quality and exceed expectations for aesthetic design and durability. 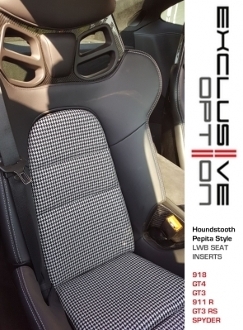 Similar to the fabric pattern on the "1 of 1" 911 1,000,000 vehicle, the vintage inspired design of these Houndstooth Seat Insert covers compliments most interior color combinations due to their neutral color palette. These are very similar in feel and texture as to what is found in the factory cars. Factory pass through and 5-point harness compatibility intact. With the easy slip-on installation of our replaceable Seat Inserts, customers can store their original Alcantara covers for track days, swapping on occasion, or even preserve for future resale. Each set will come ready to install within minutes. No special tools or skill is required. Our seat inserts come with a Limited Lifetime Warranty against manufacturing defects.